Before writing, learn to think. The “Gheorghe Dima” Music Academy has had, along almost a century of being, a rising path, marked by permanent artistic, educational and scientific accomplishments. If the first two objectives could be accomplished ever since its founding, in 1919, the third one, scientific research, although not completely absent during the first three or four decades, knows a more and more vigorous rise during the past fifty years, contributing to the advancement of the general level of education . Beginning with isolated researches, gradually, systematic approaches of the essential aspects of Romanian and universal musical creation, interpretation and pedagogy have been reached. This comprehensive vision was due to the establishment of a dense network of musical institutions, around the country: philharmonic orchestras, academic choirs, lyrical theatres, as well as a multitude of choral and chamber ensembles. All these institutions and ensembles favoured scientific musicological research, which culminated with the introduction of the musicology doctoral studies at the „Gheorghe Dima” Music Academy, around 1970. 1965 was a turning point for musicological research in Romania. The Composers’ and Musicologists’ Union initiated the annual publishing of an ample volume of studies entitled “Musicology Studies”, for musicologists and musicians around the country. That same year, 1965, the “Gheorghe Dima” Conservatory of Music in Cluj- Napoca began publishing the series entitled “Musicology Papers”, which, despite an unfortunate interruption, reached its 25th volume. The initiative belonged, of course, to the managing body of the Music Conservatory and to its rector, prof.univ. Liviu Comes, distinguished composer and researcher, as well as to the professors directly involved in musicological research and to the grand maestro of Romanian composition and musicology, Sigismund Toduţă. 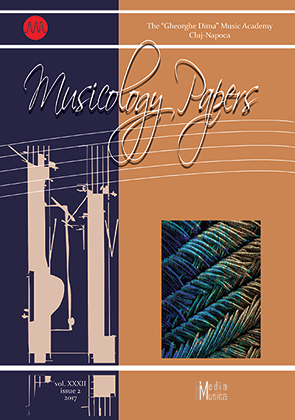 Each volume of “Musicology Papers” contains papers presented by the professors of the Conservatory at the annual symposium, together with works of researchers and musicologists from Bucharest, Iaşi, Timişoara, Tîrgu Mureş, Oradea, Lugoj and even abroad. The researched areas are multiple and varied: universal musical creation, from the Middle Ages to the present times, Romanian musical creation, especially the contemporary one, aspects from the activity of the institution along the decades, folklore, interpretative art, musical education etc. The studies published in the volumes of “Musicology Papers” have generated extensive research of the musical field and subscribe to a spectacular perspective, written not only by established researchers, but also by Mastrs’ or doctoral students bringing freshness to the musicological research of the “Gheorghe Dima” Music Academy. The idea of establishing the “Musicology Papers” journal in 1965 represented a major event in musical life, through the multiple beneficial effects it had on both the authors included in the journal and its readers. Looking in retrospect, one cannot help being impressed by the broad range of areas covered by the scientific papers published, which are to this day paragons of professional competence and integrity. Equally commendable are the unflinching efforts of the editorial board to abide by the norms of the scientific ethics and to provide abstracts of the papers in widely spoken languages, which has facilitated the exchange of editorial material with major musical institutions abroad. Ninuca Oşanu Pop, Professor, Ph.D. Copyright © 2011-2019 Musicology Papers. All Rights Reserved.